Christ is Risen! And life is bursting forth all around us as spring has finally arrived. I've spent some wonderful times with my family in the natural world recently, grateful for all of the beauty that is unfolding. To me, there is nothing better than spending some time in the woods, away from the busyness and cares of this world, to experience renewal and joy. Watching my children interact with the natural world is also a reminder to me of how we often make life so complicated, when it is the simple things that can bring us the most joy. Often times, our walks are rather short length-wise, but span a couple of hours time. 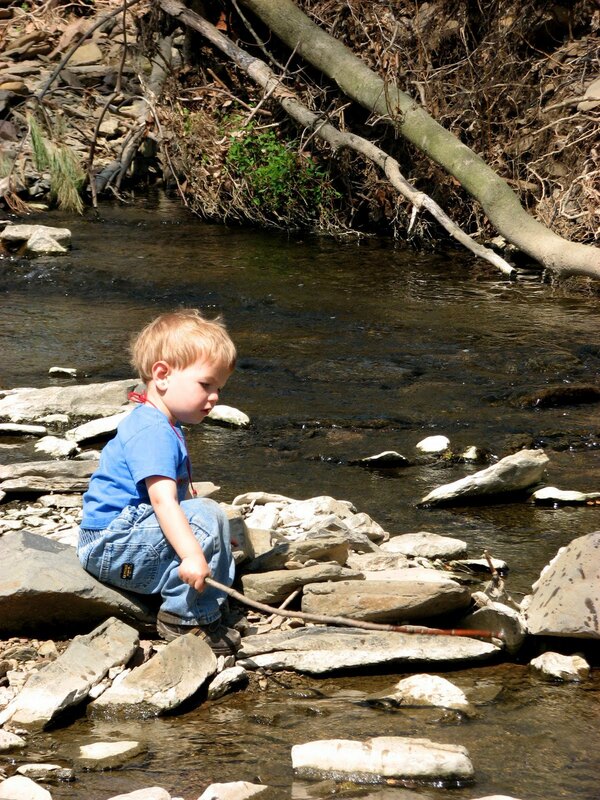 Children have no qualms over taking great amounts of time to explore every nook and cranny of a small area, discovering the hidden jewels many adults would overlook. They seem to intrinsically know that, in the natural world, we can experience God's goodness, and truly "taste and see that the Lord is good." After the long journey of Lent, we are quickly approaching Pascha! What a celebration we all have to look forward to! Yet it is during this time of year that I often feel the most grief and shed the most tears for the suffering of animals in this world. I know that amidst all of the joyous cries of, "Christ is Risen!" there will be feasting upon the bodies of animals who have suffered and died to fill our stomachs. Yes, I know that as Christians we are not compelled to abstain from the eating of the flesh of animals or of other foods that come from animals. Yet, all the same, my heart cries out for mercy and justice for the animals (the animals God entrusted in our care) in our celebration of Christ's Resurrection. I find it incredibly sad that people such as myself who consciously choose to abstain from the eating or wearing of animals and animal by-products are often labeled (in a derogatory way) as "radical" or "strict" vegetarians. If making an effort to choose compassion and mercy in response to suffering in this world is frowned upon as being eccentric, then that only strengthens my longing for the Kingdom, where "there shall be no more death, neither sorrow, nor crying, neither shall there be any pain; for the former things are passed away." - Revelation 21:4. At the same time, it is not surprising that we treat God's creatures and the rest of God's creation in the way we do. We live in a fallen world... a world in which our sinful natures lead us to gluttony and mistreatment of the world. Patriarch Ignatius IV of the Antiochian Orthodox Church once said, "If nature is not transfigured, she becomes disfigured." If we truly lived a sacramental life, today's factory farms and automated slaughterhouse lines would not even exist. As I said before, it is impossible for me to believe that God would bless the way animals are treated in these systems. On a positive note, I have noticed a trend in Orthodox Christianity in which there is an increased focus and effort to take environmental concerns, often called "creation care," into consideration. This is wonderful. However, where is the mention of animals? Are they not a part of God's creation, too? So, for me, at Pascha my deep sense of rejoicing comes not only because of what Christ has done for people, but also for what Christ has done for His whole creation. "The salvation of human beings which is offered by and in Christ, is for us a cosmic event. Through human beings, all creation will be saved. Christ not only saves us from ourselves, he offers the redemption of the whole of creation." I'm often disturbed by the quality of some of the children's books I find in the library stacks and bookstores. Quite frankly, I'm surprised that some books have not only been published, but have turned into a full series. ("Walter the Farting Dog" is one that immediately comes to mind. Do we need to dumb down our children with these debased types of stories? Has our culture really dropped to this level of cultural emptiness? How truly sad and scary....) I believe it is vitally important for us to guard our children from stories and images that can be damaging to them. Bishop Theophan the Recluse wrote, "It is well known how powerfully corrupt images act upon the soul, no matter in what form they might touch it." Children's books are no exception. So when I encounter books with beautiful writing and engaging stories that draw the reader and listener in and have some spiritual or edifying value to them, I am excited! I love books that can teach my children something about history or their faith by way of beautiful artwork and storylines that are not full of dry, lifeless facts. Here are a few examples of a few such I have read with my children recently. One of the things I particularly like about them is that, in each of these books, animals are not used and abused as commodities, but are honored and cherished in different ways. I would love to hear some suggestions of similar books that have been well-accepted into your families as well. It often happens that I think of something I want to write about here, but then I don't have much time to articulate my thoughts. So, I've decided that I'm going to change the way I had been relating to this blog. I'm going to allow myself the grace to make it simpler. A line or two written will be more cathartic and beneficial than thoughts swirling around my head with nothing written at all. I don't know where this new direction in perspective will take me. So, we'll just have to see! "If man does not simplify his life, he will end up tormenting himself. But if he simplifies it, all his anxiety will go away." I have not posted for quite some time because life has been overflowing. Seems there are so many things to do and not enough time available to accomplish everything. How interesting it is that we have a plethora of technological inventions designed to make things easier for us, yet we often continue to feel overburdened by work and responsibilities. Many days I long to live in a different era... in a time with less technology and more community. Something about our way of living feels so unnatural and imbalanced. I long for stillness, for quiet, for a refuge from this world and its seemingly endless current of activities. I find myself waxing nostalgic for the times when I was living, working, and learning in community at an organic farm and an ecovillage. Before I was married and had children, I lived a much simpler life. Now I find I'm in a continual struggle to balance my deep longing for simplicity with meeting the needs of my family. It is not always easy. We live in a world of too much information, too many choices, and too much "stuff." In the midst of this culture of overload, it can be easy to be lured in by worldly distractions. Part of me wants to just flick the switch off, but there are practical considerations to be considered. I pay most of my bills online, saving paper and simplifying my recordkeeping in the process. I am part of a homeschool group that posts its activities only via an online community. I find online mapping software to be incredibly easier than looking at a map for directions (Yet, interestingly enough, I traveled all kinds of places in my younger years with a good-old-fashioned map. So, perhaps this is just my laziness.) And (ironically) my husband and I are about ready to launch an online business. I have been reading a wonderful book, "With Pain and Love for Contemporary Man," a collection of spiritual counsels from Elder Paisios of Mount Athos. Elder Paisios points out that, "In the old days, when we did not have telephones, taxes, and all kinds of gadgets, we lived tranquil and simple lives." (p. 153) While I ache for a world free of such distractions, this is not the reality in which we live. So, the challenge for me will be to "separate the wheat from the chaff." One moment, one breath, one decision at a time. "O God, enlarge within us the sense of fellowship with all living things, our little brothers to whom Thou hast given this earth as their home in common with us. May we realize that they live not for us alone, but for themselves and for Thee, and that they love the sweetness of life even as we, and serve Thee better in their place than we in ours." It always saddens me when I see a child purposely stomping on ants or worms, or someone killing flies with a fly swatter (what an awful contraption!). As though their lives hold no meaning or purpose. As though God did not create even the smallest of creatures out of His love. So when my son ceremoniously picks up worms off of a dry sidewalk and places them into the cool, moist soil, or lovingly constructs little houses for his friends the ants, I am filled with joy that there is hope for the creatures. That it is possible to cultivate in our young ones a reverence and respect for all of life. I recently read a wonderful book, "Salt of the Earth," about Elder Isidore (1814-1908), of Gethsemane Hermitage in Russia. It was beautifully written by his spiritual son, New Martyr St. Paul Florensky, in a way which drew me into the life of this holy man and made me feel as though I had come to know him personally. Of particular interest to me was how he showed such loving kindness to God's living creatures. He sang the Psalms of King David to a frog who lived in his garden. And not only did he feed wild animals and birds, but he also prayed for them and acted as their guardian. On one occasion, he rescued a sparrow from the clutches of a cat's paws and brought the bird into his cell to live until her wounded wing was healed. And one of my favorite stories is about how Elder Isidore lived in harmony with mice in his cell. Once he was asked, "Father, don't the mice ever bother you?" The Elder smiled: "No, they don't bother me at all. I feed them lunch and supper and that keeps them quiet. Before, they would claw their way all over the cell. But now I put food out for them to eat -near the mouse holes- and they don't run around anymore. No, they don't bother me at all." Now I'm not suggesting that we should all share our homes with mice and ants. Most of us (myself especially) are far from the holiness of Elder Isidore. And there are certainly some potential health hazards involved, for young children in particular. But should our treatment of creatures be dependent upon whether we deem them to be cute and cuddly? Isn't it possible for us to take some steps to try to be kinder to all of God's creatures? We have had our share of mice, bees, ants and the like wanting to raise their families in our house. Like I tell my son, we don't have any problem with visitors, but we don't have enough room in our house for everyone to move in. So, we do what we can to gently encourage them to make their homes in the great outdoors. 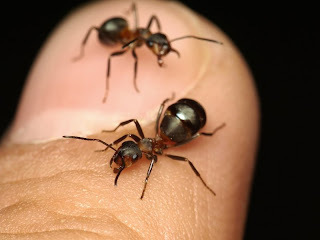 We have had great success discouraging ants in our home by sprinking a lot of cinnamon near their favorite entryways (They don't like to cross it.). Humane mouse traps (or "mouse houses" as my family calls them) worked wonders at helping our resident mouse stop his late-night parties in our living room sofa. (Although it did take a 15 minute train ride out of town to help him forget his way back!) And last year, there were some bees building a hive in our bathroom window. While it was a long time until we could open our window again, the bees eventually did leave. In the meantime, we were given the blessing of being able to watch them close-up as they built the hive, something we most likely won't be able to witness that closely very often. We may have had some minor temporary inconveniences in our attempts to be kinder to God's creatures, but the blessings far outweighed the costs. St. Basil the Great once said, "The wisdom of God is revealed in the smallest creatures." What is more spiritually edifying, stomping on an ant, or taking the time to marvel at one? I have a pretty good memory. No, I can't always remember where I put my wallet or the five million little notes I've strewn throughout the house. But there are some moments and events that leave me with powerful and long-lasting images. Last week, I added another one to my collection. I was driving along the road with my boys in the back seat. Up ahead, I could see the traffic was slowing down. "Are we approaching the section of road that's supposed to be closed today?" I wondered to myself. I wasn't too familiar with this area, so I was preparing myself for what direction the upcoming detour would take me. I quickly learned there was no detour at all, but a scene that will be forever etched into my heart and my mind. A deer sat on the side of the road, a towel covering her head and blood streaming from her head/mouth, with a woman standing guard beside her, waiting for the help that was just arriving on the opposite side of the street. I saw it all so quickly, as I was in the midst of a line of a couple of cars and had to keep moving (albeit a bit slower than one would ususally drive here) so as not to cause another accident. Yet one of the things that immediately came to mind was,"Is Jacob looking? How can I divert his attention before he sees what's happening?" I didn't want him to see the suffering of the deer. I didn't know what I would say to him. I didn't want him to see my face as I choked back my tears, not wanting to upset him. Thankfully (for me) Jacob was oblivious to what was happening. He was sitting there innocently looking ahead. He didn't see the deer. He didn't even notice me crying or hear me quietly praying for the deer and the woman watching over her. But was my reaction was on the right track? Of course, we want to protect our young children from experiences that could be harmful or detrimental to their growth. Was this one of those experiences? Perhaps this could have been an experience which deepened his love and empathy for animals. Perhaps this could have given us an opportunity to talk about how God's intention was for life and not for death. Yet when I looked back at my boys, still so young and fragile, my heart ached as I thought of how, little by little, their innocence will be eroded. They will have to come face-to-face with all kinds of struggles and sufferings, and eventually, death, in their lives. Shouldn't we aim to shelter them and preserve their innocence for as long as possible? I don't know. There certainly are no easy answers. It's during these times when I am reminded of how helpless and lost we are without God. Sometimes, all we can do is cry out, "Lord have mercy."